Our 5 senses leave us blind to a whole lot of things going on around us in the physical world. As I learned about electronics and physics, I became interested in devices that allowed us to "see" this unseen physical word. I bought or built oscilloscopes, spectrum analyzers, receivers, IR scopes, etc. Understanding my interest, someone gave me a 1950's radiation meter. I truly cherish this rare collector's item, but at the same time always wanted a more modern, portable, digital radiation meter. I scoured the surplus market for such a device, but the prices were just too high. About a year ago something changed. Radiation detection devices intended for retail sale in Russia and Ukraine started appearing on eBay. At first, most were just simple detectors. One of these is the DRSB-88. You can read my review of the DRSB-88 by following the Links Below. As time when on, a larger selection of such devices started appearing on eBay. I finally found a unit from Ukraine that looked like it fit all my requirements. You may get more out of this article if you read the The LinuxSlate.com Guide to Buying a Personal Radiation Detector first. The unit I purchased is the Ecotest MKS-05 "Terra-P". This is a device about the size of a very thick mobile phone. It has 2 buttons and a simple LCD display similar to those found on low-end Digital Multimeters. Also in common with some DMM's is its yellow plastic case. The plastic is quite thick, and the unit looks durable. The back of the unit has 2 doors. One is for the battery compartment, and the other uncovers the actual Gieger-Muller (GM) tube. The door is not for replacement of the tube, it has another purpose that will be detailed below. Back of the MKS-05, showing the 2 removable doors. As I mention in my Buyer's Guide, these devices are not constructed like high-end consumer electronics. 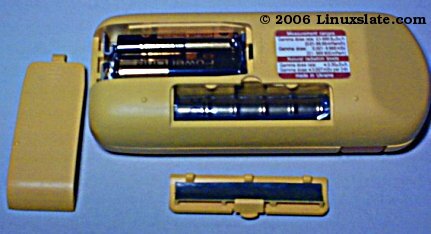 The battery door appears to be a slightly different color than the rest of the unit, and the GM tube door does not fit perfectly flush. The catch on this door also seems small and delicate. I have taken the door off many times, and it still is fine, but I feel that it may eventually fail. The two buttons are large, and must be pushed firmly to operate. The display is simple, and while there is no contrast adjustment, and no backlight, it can easily be read in almost any light. The display has 4 full digits, and a few special symbols. The symbols indicate the display units, the battery level, and the alarm function. In addition to a symbol on the display, the user settable alarm triggers a very noticeable sound on the unit's small piezo speaker. This speaker also signals clicks for radiation counts when the unit is in the "Dose Rate" mode. When the unit is powered on (By holding the "Mode" button for a few seconds), it enters the "Dose Rate" mode. I would prefer to call it the "Live Counting" mode. In this mode the unit behaves as we would expect a Gieger Counter to operate. It clicks for each detected particle, and displays the time integrated counts as microsieverts per hour (µSv/h) on the display. There is no way to select other units, however microsieverts can be converted to microrads just by multiplying by 100. If you prefer to think in rads, just ignore the decimal, and read the display as microrads. It is not my intention to reproduce the owner's manual here, but I would like to spend a little more time describing this mode, because it is the most important mode for measurement of both ambient radiation, and for testing an object for radiation. When the unit is first switched on, it begins integrating counts. It displays a preliminary value in 10 seconds while continuing to integrate counts. This works very well, and the reading usually stabilizes within a few of these 10 second intervals. After 60 seconds, a sufficient sampling of the radiation level has been performed, and the display stops blinking, indicating that the displayed value is accurate. Events continue to be counted, with a ping sound for each one, and the display is updated every 10 seconds. This works very well to provide an initial assessment very quickly after power up, and to continue to display a reading that does not jump around with every natural variation in detected events, but updates fast enough to be considered a "live" reading. There is no way to mute or adjust the volume of the speaker in this mode, but this is the only mode in which the clicks are heard. The next mode is called the "Gamma Dose" mode. Think of it as accumulated dose mode. It is displayed in mSv (millisieverts) to 3 decimal places. Note that this measurement has no unit of time. It is total accumulated dose. By doing some simple math, we can see that if we are in an environment of 0.10 µSv/h, we will get our first count on this display in 10 hours (0.001 mSv = 1.0 µSv). This indication is reset if the unit is turned off. It continues to count when the unit is asleep. More on sleep mode later. The speaker does not click in this mode. The next 2 modes have to do with the built-in alarm clock. Like a simple digital watch or travel alarm, these 2 modes display the time of day, and the time the wake-up alarm is set to. The cool part about this feature is that when the alarm wakes you up, it displays the background radiation level. With the exception of the unit having no backlight, it would make a fully satisfactory travel alarm. The clock on my unit also seems to be quite good at keeping time. The speaker does not click off events in this mode, but counting does continue in the background. Even when the MKS-05 is actually turned off, the clock keeps time, and the alarm clock will wake the unit up. In addition to the simple alarm clock, there is also a radiation alarm. This is preset to 0.30 µSv/h or 0.007 mSv in a 24 hour period. This is the maximum safe level for continuous exposure. This threshold is user settable by -- you guessed it -- the "Threshold" button. (The button has other uses, such as setting the clock.) If the threshold is exceeded, the unit switches from whatever mode it is in to the "live counting" mode, the alarm icon appears, and the speaker sounds an alarm. If the unit is turned off, the threshold reverts to the pre-set value. High radiation levels will not trigger an alarm if the unit is actually off. Only pressing and holding "Mode" or the alarm clock can wake the MKS-05 if it is actually off. Momentarily pressing "Threshold" also seems to reset the unit to the "Live Counts" mode. The display will reset to 0.00 µSv/h and start flashing, just as when the unit is first powered on. I should mention that there is a very small chance of a false alarm when the unit first begins counting. If in the first ten seconds, by pure random chance, a bunch of events are detected, the unit may alarm. This has only happened once, can only happen when you are doing something to the unit, and really takes an extreme coincidence of nature. I have never had the unit give a false alarm other than that. In addition to evaluating the MKS-05 for false alarms, I also checked for susceptibility to RF radiation. Reference the Linuxslate.com Radiation Meter Buyer's Guide for more info, but in short, an radiation detector meant to detect ionizing radiation should not register RF radiation. Poor design or construction could allow RF energy to get into electronics and cause false indications, alarms, resets, etc. To test this, I started up a GPRS session with my GSM phone, and placed it and the "Terra-P" back to back. In GPRS mode, mobile phones radiate more power than they do during a voice call, so this was a worst case test. The Terra-P continued to count normally, and was not affected by the RF at all. Like most mobile phones, PDA's, etc. the MKS-05 has a sleep mode that allows the unit to remain active in a very low power mode. After 5 minutes of operation in any of the 4 major modes, the unit will go to sleep. In sleep mode, the display is off, and the unit appears completely powered down -- There is no indication of sleep. Additionally, there does not appear to be any way to force sleep mode, you have to wait the 5 minutes. I usually just select time mode, and the unit quietly displays the time unit it goes to sleep. A single press of the "Mode" button (without holding) will wake the unit, and it will return to the mode it was in when it went to sleep. The radiation alarm threshold is kept during sleep, and of course, exceeding the threshold will wake the unit and it will sound the alarm as described above. In short, the operation of the unit in each mode is very nearly ideally designed. The only thing I could possibly ask for is some indication that the unit is sleeping. Any such indication however, would affect battery life, so given the trade off, I like it the way it is. You can check the status by momentarily pressing "Mode" -- If the unit wakes up, it was asleep, and will go back to sleep in 5 minutes. If there is no response, you know the unit is fully off. Obviously, the purpose of sleep mode is to conserve battery life. It is rated for 6000 hours in sleep mode (assuming a "normal" radiation level, if not, it is your lifetime that you will worry about more than the lifetime of the batteries). It is interesting to note that the manual also says that the mean time between failures (MTF) is 6000 hours. I don't really think the unit is going to fail at 6000 hours, but the implication is that you will not have to change the batteries very often. I have been using and testing the unit allot, over the last 3 weeks, including leaving it in sleep mode all day, every day. I have not seen any sign of a reduction in battery power. I am confident that the unit could be left in sleep mode, monitoring for radiation, for months without worrying about the batteries. While thicker than most Mobile Phones, the MKS-05 fits nicely in cargo pants pockets, or most mobile phone pockets. I received a custom fitted phone-type belt case with mine, but I don't use it. While I never recommend putting electronics in a back pocket, the MKS-05 is likely sturdy enough to survive even if you sat on it. I have never found the buttons to have been pushed accidentally while the unit is in my pocket. I believe that the front of the unit where the display is is plastic, not glass, so putting the unit in a pocket with keys will likely result in a scratched display. I have left my "Terra-P" in a closed car in 90+ ºF Florida sunshine with no apparent adverse effects - not even temporary display darkening. Recently, I have been turning the unit on in the morning, and carrying with me all day (in sleep mode) At my house, the background radiation level is about 0.07 to 0.08 µSv/h, so if I turn the unit on in the early morning, the accumulated dose mode first indicates a value (0.001 mSv) sometime in the late afternoon or early evening. If I ever see a larger accumulated dose, or see the 0.001 mSv's earlier than the late afternoon, I know that I was somehow exposed to higher radiation levels during the day. To test an actual object for radioactivity, simply put the MKS-05 in "Live Count" mode, and place the back of the unit on or near the object. The plastic housing of the unit will absorb alpha particles, so unless we known that the object is not an alpha source we should remove the GM tube cover. This cover is not hinged or tethered, so there is a danger of loosing it any time it is off. With the unit in "live counts" mode, the clicks from the speaker will immediately tell us if the object is significantly radioactive. The nice thing about having a digital display is that you can measure even very slightly radioactive objects. Additionally, the Gieger-Muller Tube in the MKS-05 is rather large for a pocket radiation meter, (nearly the full length of the device) and provides a good area over which particles can be detected. This allows the MKS-05 to react to radioactive objects more quickly. In the following picture, we can see a noticeable increase on the display when the MKS-05 is placed near some potassium chloride (KCl). About 0.01% of natural potassium is potassium-40, which is radioactive. In about 2 minutes, the display is indicating 0.20 µSv/h -- over twice normal background levels. Small variations like this may or may not be discernible on a device with only a light and a clicker. Even having an analog meter would leave some interpretation up to the user, but the MKS-05's display leaves no question as to the fact that this sample is a radioactive substance. (Picture enhanced to show displayed value. This is necessary due to the flash on the camera, not any fault of the MKS-05's display). Websites describing such tests state that the radioactive materials leave the body within hours after the test. They also claim that the radiation level is very low. Dozens of medical websites carried the very same article. Based on my observations, some of the statements in that article are at least misleading. I wonder what patients are told prior to such tests/procedures. Do the doctors, nurses and technicians administering them even know the true level and persistence of radioactivity, or are they just passing along the same miss-information they are given? Are patients monitored? Several other stories I found on the web also indicate that patients remain radioactive for as much as a month. Several persons have set off radiation alarms in airports and high-security areas weeks after having such a test/procedure. One of the latter group of sites recommend that patients obtain and carry a signed doctors note with them. This note should include the doctor's phone number. While such tests are often used to diagnose/treat potentially life-threatening conditions, I wonder exactly were the trade-off is between testing for a condition and possibly causing another one down the road. If you have a radiation detector with an alarm, and you are in close proximity to a person who has had radioactive thyroid treatment, a heart stress test, certain types of chemotherapy or other nuclear treatment, your detector may alarm. Now what are you going to do? This could cause an embarrassing situation. Think about it before it happens. 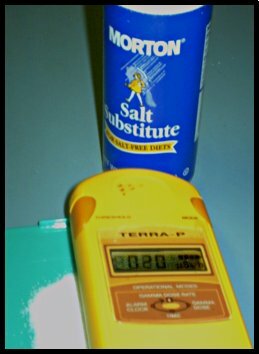 I again used my MKS-05 to check the radioactive neighbor about a week later (3 weeks after the thallium was administered), and there was no noticeable reading above background. Perhaps patients' radioactivity levels fall fairly suddenly at some point after the test. If this is not the case, and the radiation levels fall somewhat linearly, then considering how radioactive the neighbor was after 2 weeks, I have to wonder what the level was immediately following the test. Would you want to take an 8 hour flight sitting next to someone who just underwent one of these nuclear medicine tests/treatments? Would you want them holding your newborn child? Literal translations of human language simply don't work, and the results can be comical. The booklet that comes with the "Terra-P" suffers from this as one might expect. While it is not as bad as some I have seen, the literal translations sometimes make you read a sentence twice. That said, the booklet is quite thorough. I also contains a number of certificates, with real ink signatures that show that the Terra-P is compliant with regulations for such devices in a number of countries. There is a PDF of the manual available from the Ecotest website, but it is an optical scan. If I get enough emails requesting it, I will re-type the entire manual, with the grammar corrected, and post it on this site. You can find the link to Ecotest's website, and to the manual in the links below. As I mentioned, I purchased the Terra-P via an eBay auction. I had no problems with the transaction, and the unit arrived sooner than I expected it to. 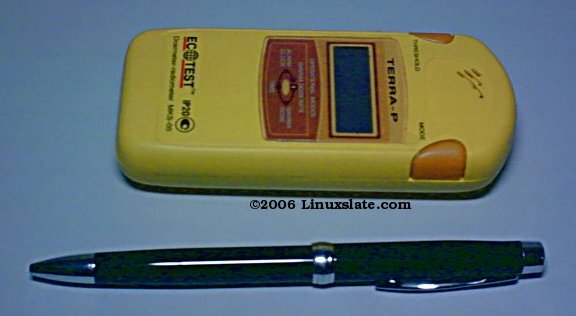 Please reference the Linuxslate.com Personal Radiation Detector Buyer's Guide for some info about the way these devices are sold on eBay. I checked out the auction and the payment method carefully before proceeding. I am 2 for 2 now (The DRSB-88 and the Terra-P), with honest and conscientious sellers, but that does not mean that all such transactions are safe, or that all sellers, or all on-line stores are honest. Extra caution is necessary in these transactions. The eBay sellers are making a profit on these items. I do not begrudge them that at all. They make the purchase simple, and ship the item half way round the planet quickly. However, it may be possible to buy these items at a lower price. One option is, of course to go to Kiev, L'viv, or Moscow yourself. If you have another reason to be in that part of the world, this may actually be the best way to buy one (or a few) of these devices. It may also be possible to buy them directly from the manufacturer's. There are some US on-line retailers selling certain models, but the best selection, price, and convenience still seems to be found on eBay. There is a sticker under the battery compartment with something written in Ukrainian. It is a warranty warning label. The basic translation is: "Do Not Remove. Warranty." Now here's a question for you. The owners manual says that in the event of low batteries, poor contact with the batteries, or some other failure, the display may indicate "PO3P" - That's the Ukrainian letter, not the number 3. That pretty directly translates to "Low Batteries". (Thanks to all those that sent translations). The Ecotest MKS-05 "Terra-P" consumer radiation meter is an ideal device for checking specific items for radioactivity, as well as monitoring your environment for unseen dangers. The price on eBay may be much higher than the "street" price, but it is still a good value for the functionality of the unit, and the convenience of not having to fly to Ukraine.